When building a child’s play structure care should be taken that it is safe and the child cannot be harmed. With a little thought your child will have a play area that will fill many hours with fun and joy. When deciding where you are going to site the children’s play area remember that it should be viewable from the house so that adults can see what the children are doing at all times and that they are safe. Can the play area be approached from the outside? Consider this as not only can strangers enter your garden but younger children can easily stray and get lost or hurt. Perhaps fence in the play area rather like they are at a public park. This will also stop animals going into the area and soiling toys and sand. The ground beneath the play area should be safe to play on. Hard concrete can cause many cuts, grazes and broken bones if a child should fall. Honeycomb matting and outdoor matting are two of the products that are available for the area around a child’s play area. Some people use bark chippings to cushion the ground but this can still be hard and can be very messy. Speak to your building supplier for some soft sand for the sand pit (make sure it can be covered when not in use to prevent animals going in it). There are so many children’s plastic toys these days that would be ideal for a play area. Wendy houses, tepees, slides and swings. These are easy to dismantle and to keep clean. Best of all they can be left out in all weathers so do not need inside storage or maintenance. Wooden climbing frames and rope swings are enjoyed by children but make sure that they are well anchored into the ground and that there are no nuts, bolts and sharp metal items sticking out to catch small hands and faces. The wooden toys will also need treating every year or they can start to fall apart and be unsafe to use. Trampolines are great fun but remember when fitting them that children can fall and be hurt. Fit netting around the sides and make sure that play is always supervised by an adult. You can purchase some trampolines that are fitted into the ground so that they lay flush with the level of the play area. Even so an exuberant child can bounce off this equipment so an adult should be there at all times during play. 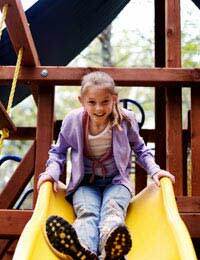 Also ensure that no adults or larger children play on equipment designed for a smaller child as this will not only weaken the structures but can hurt a child if they should fall. Think seriously about having a pond or swimming pool that is accessible to a child as accidents can happen so quickly and young children can drown in a few inches of water. Covers on ponds and pools can also fool young children and dogs into walking onto what they think is a secure flooring and they can so easily fall into the water below. Teach a child about safety around the garden so that they are aware of dangers and learn to respect their play area.